Alain Pascal could be a character pulled right out of a Marcel Pagnol novel--a kind of Provençal Hercules. Like his father, Honoré, for whom the domaine is named, Alain is a strong, husky man with hands the size of bear claws. That he is a former boxer and an avid hunter should be no surprise, yet his physique matches both his spirit and his wine--this gentle giant and his cuvées are all heart. Of the many stories recorded in Kermit's Inspiring Thirst, those of Alain are among the most entertaining. For years he sold his prized fruit from Bandol to Domaine Ott and Château de Pibarnon. Though he and his father would bottle their own wine for family consumption, they never labeled it under their own domaine name. Kermit has called those early family wines, "Magnificent Bandols made in the simplest manner, très franc de goût, with a whole lotta soul." In 1997 after his father's death, Alain officially started Domaine du Gros 'Noré, a real shift that has brought him more than just casual notice. 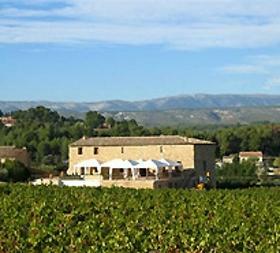 Alain is already a leading contender in Bandol, the appellation regarded as the grand cru of Provence. Quiz just about any Kermit fan about the boxer turned winemaker, and chances are Alain’s name—along with a slightly caricatural image of a brawny man with rough hands—immediately comes to mind. Picture that man, famous for his potent, rich, tannic reds, pouring you a glass of perfectly pink rosé. Wine Spectator 93 WS TOP 100 2015 Rank 94 "This has a dark leathery frame but remains sleek and pure overall, with a dense core of currant preserves, steeped plum and lightly mulled blackberry fruit, studded with dried anise and singed juniper notes. A bolt of iron is buried deeply on the finish. "A very solid blend of 80% de Mourvedre,15% de Grenache, 5% de Cinsault. The vineyards are composed of both clay and limestone, imparting a pronounced structure of earthy, splintered rock. This microclimate near the Mediterranean brings warm weather and full sun, tempered by the persistent Mistral.